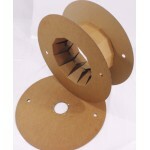 100% Corrugated Cardboard 100% Recyclable - Avoid The Headache Of Disposing Of Your Plastic Reels. With growing concern over the environment and increasing pressure on companies to provide sustainable and less environmentally damaging products, these 100% recyclable spools, drums, reels, or whatever you refer to them as, will provide a much needed alternative to the traditional plastic design. Perfect for use as cable reels, banding reels, foam reels or for fabric & textiles etc. They of course have the added advantage of being easily recycled after use. This can have a major impact on reducing the problems your customers may be experiencing when attempting to dispose of their plastic equivalents, saving them considerable time & money.